MANLA, Philippines – When Korea’s first blockbuster zombie-themed film “Train to Busan” hit Philippine theaters, the movie earned positive feedback and has been commended for giving a thrilling viewing experience. But this train-themed-zombie flick also captured the witty minds of Filipinos as memes based on the current railing system in the country were hilariously applied. As “Train to Busan” hit theaters last September 1, netizens hilariously compared the film which is centered in a zombie-filled train to the country’s own railways and the daily commuters experience. In a post by “PUP-Memes,” the Facebook page calls that if the only safe-zone is in PUP’s mini Intramuros (due to its high walls) but survivors were left to train to PNR, there will be no one left uninfected. The Facebook page cries to modernize the country’s rail system. Facebook page “PULPOLitika” posted a one-liner to a parody photo “Train to Ubusan” which shows the daily commuters’ experience in both Light Rail Transit (LRT) and Metro Rail Transit (MRT). Netizen Jerome Papa Lucas posted a photo entitled “Train to Ubusan ng Lahi.” He wishes if the country could also have a film titled “Train to Ubusan ng Lahi” and starred by MRT. “Hindi na kailangan ng horror and suspense elements ng script. ‘Yung mga bagon at mga pasahero na mismo ang magpapakita kung gaano ka-horror at kung gaano ka-suspense ang pagsakay sa public transportation sa Metro Manila...” (There’s no need for horror and suspense elements in the script. The cabins and the passengers will show the horror and suspense side of commuting in the public transportation in Metro Manila) Lucas wrote. 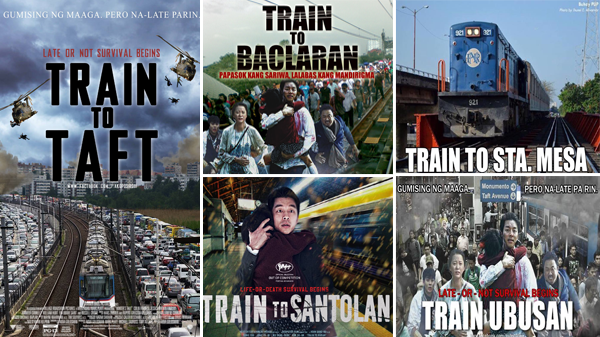 While another netizen Mico Tique posted a “Train to Santolan” movie poster parody depicting rush hour on daily commuters. Netizen Caithlin Villarin wittingly posted photos from the film were not different in real life commuters struggle.